The Casino Cat reviews Poker Room, online poker site. 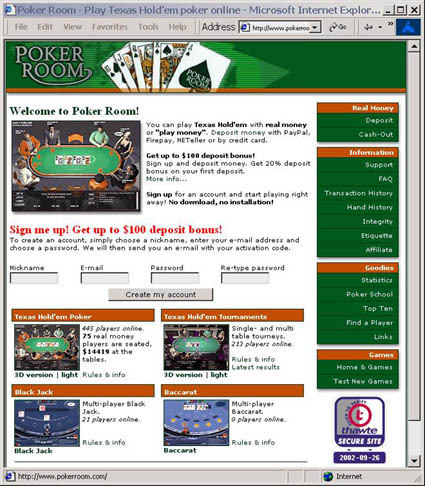 The Poker Room is really for you Texas Hold 'em lovers, the site offers a few different options depending on which format and game you would like to play. There is no download required, everything is right on the web. It's a great way to meet some fellow poker players and have some fun at the same time. Click here to take a look. • Sign up and deposit money. Get 20% deposit bonus on your first deposit. 3D Version (300kb) 800*600 screen size with better graphics and sound effects. Light Version (120kb) 640*480 screen size has cartoonish graphics with a smaller download time. 3D version (255 kb) 800*600 screen size with advanced 3D graphics and higher sound quality. Light version (130 kb) 640*480 screen size with smaller download time an less enhanced sound and graphics. Multi-player Black Jack (300 kb) 800*600 screen size with a table limit of $1 - $100. Game is played with 2 decks - double after split, dealer stands on all 17s. Multi-player Baccarat 800*600 screen size, real money limit is $1-$10, played with 6 decks, a tie pays 8 to 1.